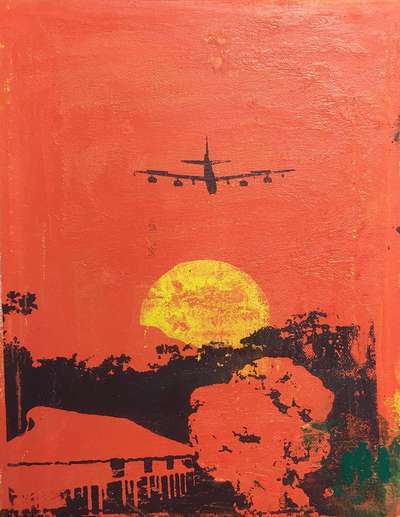 My art piece displays a B-52 bomber on a carpet bomb run flying into the distance as a bomb explodes on a small village. I used the very defined layers created by screen printing and contrasting colors to create an image that looks like it pops. All the colors though contrasting are reds, except the children, making them blend in less to the print. Though their color makes them more visible, they are small and dull compared to the rest of the picture, making them almost invisible. This represents the problem of civilian deaths and the blatant ignorance that officials show towards it, making their lives almost worthless. My art piece was created using screen printing, a technique that uses a silkscreen and photo enamel to print on cotton. This process produces very smooth and clear layers. This technique makes something very flat look three dimensional. Using a very simple set of colors makes any deviation pop out. In this piece I’m trying to show how civilians are treated during war. I was inspired by many images of severe burns on Vietnamese civilians and pictures of thousands of homes being destroyed in the firebombing of Japan during World War two. Even though war should be between two soldiers it always turns to killing unaffiliated civilians. In every war we kill civilians, If on accident during carpet bombing, or on purpose during tactical strikes. Civilians are seen as an asset to the enemy not a bystander. Because of this, officials regard for their lives has been reduced to less than that for the enemy's soldiers. During this project I Learned a lot about modern war politics about the gulf of Tonkin and about how brinkmanship and M.A.D (mutually assured destruction) have changed war. Because of M.A.D direct combat is never an option, but because of brinkmanship piece isn't an option either, so that is how proxy wars were born. A proxy war is when two opposing sides of a war (usually civil) are backed by rival countries. Like playing chess with real people you can clash without fighting between either side. In a quote from david hayter “War has changed. It's no longer about nations, ideologies, or ethnicity. It's an endless series of proxy battles, fought by mercenaries and machines. War--and it's consumption of life--has become a well-oiled machine. War has changed.” because of this, war politics has just become a pile of lies, excuses to fund wars in other far away countries, and funding to create the next weapon to threaten others with until eventually someone finally presses the button. During this project I learned a lot about how long lasting decisions can be in politics, as well as how war affects different people. Though at this point you would think war would be normal because it happens so frequently it almost never ends up that way. I looked specifically the lives of civilians and noncombatants and even though many of them have nothing to do with the war they are killed just as much. As for soldiers many of them have to watch the person next to them die or see the grenade they threw blow off someone's leg. Society doesn't prepare you for that and it doesn't nurture people when they come back either. For example during the vietnam era because of all the war protesting veterans who wanted the fighting to stop just as much were treated the same as the politicians who started it.